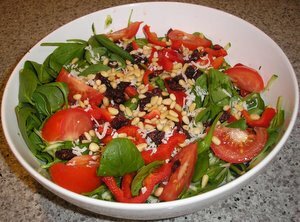 Adding some pine nuts, shredded coconut or dried cranberries to fresh spinach salad recipes gives them a new level of tasty interest. Add all three and you get a spinach salad recipe that is a taste sensation. Gently combine greens, zucchini and capsicum in a large salad bowl. Arrange tomato quarters on top. Sprinkle with coconut, pine nuts and craisins. Serve with a light and simple salad dressing such as olive oil and white wine vinegar (2 parts to one). You can substitute dried apricots or goji berries for the dried cranberries. This salad matches well with a BBQ in Summer.